Changes in the times have meant closer relationships between children and their parents and other adults, rather than the king/servant kind of relations that used to be the norm--the kind where children were seen and not heard, and could ask no questions. The few children who were bold enough to rebel were reprobates. John Stuart Mill, John Ruskin, Lawrence, Tennyson all wrote biographies that tell of such childhoods under authoritarian rule. Children raised like this grew up capable enough, but modern advances should bring about more noble character. For one thing, children who are not afraid to ask questions can bring up doubts and concerns that, in previous times, children would have had to struggle with on their own; often an adult can easily clear up misguided notions that children have. Locke said that a well-trained reason should be the ultimate authority (rather than the puritan tradition of religious parental authority? ), and, though he was too religious to try his own teachings, his idea was accepted readily in France––and helped spur on the French Revolution. In Charlotte's day, Herbert Spencer followed Locke's idea of infallible reason to its logical conclusion and felt that reason opposed docile submission to authority and, eventually, God Himself, who is the ultimate Authority. Spencer wanted children to be free from any authority that was imposed from without, and to use their own reasoning to decide what was right for them. Even the rules of grammar lessons were thought to hinder children's freedom to decide for themselves. Spencer's teachings have so influenced child-rearing practices that common parents use his ideas without even knowing where they came from––and without realizing that their goal is to throw off the burden of God's authority. We must analyze every idea before we follow it. Reason is not infallible, and what man thirsts for is not really freedom to direct his own life, but contact with God. Man needs authority––a team needs a captain, an army needs a leader. Without authority, there is anarchy and chaos. Though submission to authority makes no sense to our reason, it is inherent in humans to follow a leader and to submit to authority. We deem acts of sacrifice when obeying military orders as heroic, and, though slavery is an abuse of authority, it couldn't exist without humans' tendency to submit or lord authority over others. Every man existing without authority and living in total liberty is not realistic. The truth is, man needs some liberty, but he also needs to serve and be served in and under authority. We need both. God gave authority, but we have learned that authority rests in the office, not the person; the person in that office is also under some other authority limiting his power so he can't abuse his position. People will respond with docility to a person vested with authority acting on behalf of a higher authority; they will rebel against a tyrant acting on his own behalf. Charlotte tells of a mother who, though worthy and extraordinary, acted on principle to such an extent that, when she made a mistake, it was the principle at fault. She believed strongly in the principle of children submitting unquestioningly to authoritarian parents. She thought obedience was important for its own sake and would even bid her son do bizarre things, or subject him to temptation, just to train him to obey in all circumstances. She set her son up to desire a sumptuous pudding, set the pudding before him, and then, just before he began to eat it, made him take it to a needy family in the village. Though her loyalty to principle was a bit much, Charlotte admires her wisdom in other areas––such as expecting obedience and not checking up to see if her son had neglected to obey, because, in doubting whether the child will obey, the child sees that disobedience is an option. And she never repeated a command; her son had to obey the first time. This mother did her best, but she didn't differentiate autocracy (self-derived power) from authority (power given by someone else). Autocracy is like a tyrant––impatient, always looking for someone stepping out of line, harsh in punishment, full of rules. In children, autocracy shows itself in willfulness and belligerent refusal to comply. Authority is gentle and can afford not to be looking for error because authority is given over specific matters and is therefore limited. Teachers have been given authority over a child's schoolwork, for instance, but not his bedtime or spending money. Within the prescribed limits, authority can be merciful, and has nothing to lose from hearing the side of the one who is under authority and judging in his favor if some slight or injustice is perceived. Queen Elizabeth is an example of a good ruler––she knew when to yield and not yield, and could do both tactfully. She knew her limits and when to listen to the advice of counselors wiser than herself. She put the good of those she served––her people––ahead of her own. Parents should teach their children to obey automatically, as early as a year old (good habits can't be taught too early!) Obedience should require some physical effort––"sit up straight" or prompt, quick compliance. This physical aspect of obedience trains the child's obedience to become mechanical––automatic, involuntary through practice. If the child can submit automatically to his parent, he will have a head start in compelling himself to do what he doesn't feel like doing later––and this amounts to self-control. After all, anybody can have good intentions, but it's those who can muster the self-control to make themselves put intentions into action that succeed. Isn't it enough to make children heed the voice of their conscience? That is necessary, but it isn't enough. Though children must learn to see two choices before them and choose the good over the evil, the effort of decision-making itself can be draining, but many of those decisions can be avoided by making it a habit to do certain things––for instance, getting into the habit of rising every morning at 6am eliminates the decision about what time to get up. Children having too many decisions to make may become nervous and worn out; most of what is done in life can and should be relegated to acting by habit. Parents should "form habits upon which the routine of life runs easily" and thus leave less left to be decided upon. Children have a sense of logic and will resist arbitrary commands that don't make sense. On the other hand, parents shouldn't feel compelled to convince a child that every command is reasonable before the child submits to obedience. Parents should balance the two, expecting obedience whether the child agrees or not, but attempting to make the child understand whenever that's convenient. By making most commands a matter of habit, there are fewer additional commands that may need to be explained. There will be times when a child will have to comply simply "because it's right." Children may need a heads up when something is expected within a time limit––a five-minute warning, perhaps, or an idea of how much is expected in the allotted time period. Giving some prior warning that bedtime is close prevents a child from balking when, midgame, suddenly he is expected to be in bed with no warning. Mothers make good home-leaders because, in spite of their authority, they are compassionate and sympathetic with their children. The mother who trains her children to divert their thoughts as a matter of habit, and trains them to prompt obedience, will have a much easier time of it. Even difficult children can be easier to handle when right habits are in place. We all feel a sense of anxiety and responsibility as adults––women for their duties and relationships, men for issues of the day (at least, that was how Charlotte perceived who worried about what a hundred years ago!) Parents feel a great responsibility to educate their children and train them to do what they ought to do as proper citizens, and Charlotte wanted her PNEU schools to help parents with this responsibility. Having a sense of what should be done can make us anxious if we don't know how to go about getting it done, and the time between taking in information and understanding how to apply it can be an anxious time, since we have a gap between knowledge of the task and our ability to put it into action. Masterly inactivity is not neglectful indolence. It is stepping back when we could take control and allowing our children to do for themselves while all the time they have a secure sense of feeling the safety of parental authority over them to help if needed. Without the limits of that authority, children have too much license but aren't really free. Parents should maintain a sense of humor and cheerfulness that exudes confidence in their decisions. A mother may decide that it's within her authority to skip lessons and make it a fun day with confident cheerfulness and maintain a strong sense of control, but a mother who resigns herself to do so because she won't stand up to her children's whims is showing weakness. Parents should be confident enough in their authority not to feel compelled to over-explain, smother or fear making decisions. Mothers should not make personal servants of their children or burden them with thoughts and concerns that are inappropriate for children so that the children are so busy with her affairs that they have no time to be alone. Parents should trust their children and have confidence that they can choose the right thing, and are capable of doing what they should. If they've done a good job in training, they should have faith that their children will rise to the occasion. Parents should be wise enough to know what their children are up to without seeming to be hovering and restricting the children's liberty. Parents should not be easy marks for their children to deceive, and children should obey because it's their choice, not because they are coerced. Children should be free enough to use their own will in deciding to do right, yet should have enough authority to desire not to do wrong. "He is free to do as he ought, but he knows quite well in his secret heart that he is not free to do that which he ought not." Children who are told to be good but who have no strong authority will either do wrong as it pleases them, or face tough decisions about every action, a lonely struggle. To illustrate––adults are free to obey the law or break the law, no one is compelling them to be law-abiding. But the knowledge that there is a strong penal system deters most from choosing a life of crime! Mothers should be relaxed because a nervous, complaining mother will be contagious and her children will 'catch' a spirit of bickering and rebellion. She should be serene, like the Madonnas that have been idealized in art. She should take time for herself, alone, possibly, to read, walk outside, go to the art gallery––whatever will help to refresh her spirit. Children should have leisure time and not have the pressure of projects that are due too soon, and an excess of rushing around in activity. Both parents and children are too stressed when life is too full of pressures. And, finally, we must have faith that God's spirit will help our children if we leave time and space for Him to work. Personal Initiative in Work––We may teach children basic skills in handling resources, such as how to apply paint and clean paintbrushes, but they should be allowed to create with those skills in their own way using their own creativity. They may not do things exactly as would, but finding their own way can be a wonderful way to show children how capable they are. Children must Stand or Fall by Their Own Efforts––Children should not come to rely on us urging, reminding and nagging them to get their work done on time. Adults depend too much on reminders for tasks such as paying dues, subscriptions, etc. Don't let children get into this habit of laziness. Marks and rewards are both subtle ways of prodding and shouldn't be a child's motivation for getting work done. It is better to let them fail to complete a task on time and suffer for it as a learning experience. Children want to do their duty and won't like being late or leaving something undone. Let their own "dutiful impulse carry children through the work they are expected to do." Children Should Choose Their Own Friends––Children who are trained properly might make unworthy friendships, but they can be trusted to realize that this friend has little in common with him and let the friendship go. But being forbidden to be friends may cause the child to sympathize and maintain the friendship out of feelings of kindness and unfairness. Here, 'masterly inactivity' must be employed with parental confidence that children know what's right and will make wise decisions. Should Be Free to Spend Their Own Pocket Money––Children should be taught how much is appropriate to save, how much to use for charity––but money that is theirs to spend should be theirs freely. Blowing a large amount on an item that the child later regrets purchasing is the best lesson in wise spending. Teens should be allowed a certain amount for their own clothes and expenses, and trusted to use it as they see fit. Should Form Their Own Opinions––We must all form opinions carefully after much research––but we can't pass those opinions on to our children. Children should be allowed to ask questions, take in information, and make up their own minds. Children who are pressured to buy into their parents' beliefs and opinions may, as a reaction, determine to choose the exact opposite as soon as they are free. Children who feel free to ask questions are more likely to accept their parents' opinions than children who aren't. We all want our children to do the right thing so naturally that it seems inborn. But this kind of goodness isn't something we're born with. Training right behavior in our children so that it seems like second nature is a matter of using opportunities to talk casually with our children about proper behavior, and then giving them time and space (masterly inactivity) to put those things into practice on their own. If we've trained them properly, we can trust them to make right choices for their lives, even if the choices they make aren't the ones we would have chosen for them. A working educational psychology should be adequate enough to cover all facets of man and his relationships, it should be the one that's accurate enough to eliminate the need to find other answers, and it should relate to every topic that's relevant in its time and culture. A working educational psychology should acknowledge the evolution (personal growth) of individuals; education doesn't just stuff facts and skills into them, but enlarges the whole person and improves them as persons as it broadens their perspective and enlivens them to new experiences. A working educational psychology should encourage the solidarity of the human race so that people become more empathetic with real compassion for other humans and feel a bond with persons who lived long ago. What is commonly thought in any age tends to be what gets written about and explained in books, and common thought is usually so widely accepted because it has truth in it, though common thought tends to swing from one extreme to the other until it settles somewhere in the middle. We must analyze the common thought of our own age and see if it is in a period of swinging to one extreme before buying into it blindly, weighing it against previous thought by reading classic books about the topic. Locke said that man only received information through the five senses, and knowledge that is worthy is all that should be allowed entrance into the mind. The mind, he said, didn't have its own character, but could be trained to employ the information received (like a machine that can be programmed?) and it was this idea that prompted him to introduce the fallacy of 'developing the faculties.' Treating the mind as a machine hardly allows for the improvement of the entire person through education. In fact, the person is nothing more than the result of the information put into him, and the training of his mind to do something with that information––the person isn't seen as a valued individual at all! The psychology of Charlotte's day was still heavily under Locke's influence, rational and treating humans in terms of scientific principles with information and minds reacting in a cause-and-effect way with little regard to the personalities of individuals. Everything is reduced to chemical reactions. This is a very materialistic concept and makes man no more than various states of consciousness. This psychology removes the sacredness of the person, solidarity of man and evolution of the individual––and Charlotte felt a necessity to correct such a sad way of viewing man and education. The emphasis on enjoying children and teaching is owed to Germans Pestalozzi and Froebel, for which we are grateful. Yet their turning kindergarten into contrived cheerfulness and sterile activities treats children more like hot-house plants than living individuals with their own ideas. Children are more than plants that will develop according to a set timetable under the correct environment. The child is a living being who struggles for existence––not only a material being, but spiritual as well. As tempting as this approach may be to the teacher, it doesn't take into account the God-given personality of the child and his ability to form his own connections naturally. If it were as simple as presenting specific lessons to shape a person, then one might create clones by presenting the same ideas to a group of children. But our own eyes show us that children are individuals who respond differently to ideas, and education evolves each child according to his personality and calling. Though these educational psychologies are flawed, we can take a bit of truth from each of them and advance a psychology that includes the truths from all of them. Charlotte saw that children who were educated according to her approach were vitalized instead of bored during lessons, and as interested in learning as they were in playing. But beyond their interest, Charlotte saw that her principles met her conditions of an adequate system as she defined them in chapter 5. Her philosophy treats children as individual persons capable of creative thought and independent action––not oysters or blank slates to be stuffed with knowledge and shaped by the teacher. The child is more than the sum total of the ideas put into him from his lessons. Charlotte's philosophy acknowledges that children can form relationships between ideas and concepts on their own, and it seeks to make best use of this by presenting ideas at the right time and training habits in children so that they become efficient in forming these relationships. This is what Charlotte means when she says "education is the science of relations." Teaching shouldn't try to force these relations through contrived lessons; the child should find them on his own by dealing with real things and authors himself. The teacher should know when to step aside and let the child make his own connections. Charlotte's system also advances solidarity of the race by putting children in touch with real authors and people first-hand, helping the child to feel intimate with people from different times and cultures. Charlotte has already established that a person is spiritual and that his will, conscience, reason and affection are not separate parts of the person, but various ways that the one person acts. He is able to make unlimited connections between ideas, but he must be exposed to ideas to make connections between them. These connections depend on memory to be recorded, so education must train the habit of precise memory as well as offering exposure to many ideas. We can't be quite sure what the scientific nature of ideas is, but we believe that ideas are live things of the mind, as Plato said. Ideas don't pop up on their own; in fact, we don't create ideas. They come to us from someone else. Once an idea is in our mind, it can stay there indefinitely, never dying. We can remember the impression a song or picture left us with even decades later. Depending on our personalities and interests, some ideas will strike a chord while others make little impression on us. A person with a musical bent will attract and notice musical ideas that another person might miss. And those who communicate ideas in works of art or writings cause the idea to live on even after the person has died. Since ideas originate with God's Spirit, and since we are spiritual beings, it shouldn't surprise us that we can pass ideas on to others. Ideas thus go from one spirit to another. Children are capable of unlimited relations joining ideas, and it is up to educators to help children form relations according to the child's best tendencies/callings and to help children develop habits to transfer those ideas into actions. Charlotte tells about Kaspar Hauser, who was locked in a windowless room with no human contact for 16 years, a true story which you can read online. The boy knew only two words and had no concept of such things as hot/cold, near/far, living things/inanimate objects. Yet he had extraordinary smell, vision, etc. and was intelligent enough to learn once he was exposed to information. Charlotte uses this story to illustrate that this boy didn't need anyone to develop his faculties or ability to make use of knowledge––all of that was already there, even after years of sensory deprivation. All he needed was exposure to ideas, experiences and information. Every child is born endowed with the faculties and intelligence he needs; it isn't the job of education to provide that for him. He already has it. Education should help him apply wisdom and make relations between ideas. Babies are "put into this most delightful world for the express purpose of forming ties of intimacy, joy, association, and knowledge with the living and moving things that are therein, with what St. Francis would have called his brother the mountain and his brother the ant and his brothers in the starry heavens. Fullness of living, joy in life, depend, far more than we know, upon the establishment of these relations." Which science text to use, or whether a child can pass an exam, or how many dates he has memorized are the wrong way to look at education. Instead, a child should become acquainted with the outside world in his own community, to know trees, birds, and flowers as familiar friends, whose habits he is intimately acquainted with and whose beauty is known to him. Soon enough, he will notice differences and similarities between kinds of trees, or kinds of flowers and will begin grouping them in his mind on his own. At this point, scientific classification becomes a natural next step that he wants for his own purposes, rather than a list to be crammed for a test and then forgotten. Knowledge that a child acquires himself through his living experiences will mean infinitely more to him than facts from a book that have no relevance to his life that he can recognize. There are specific things that children must form relations with, and Charlotte describes each of them. 01. The fields of science are all interesting to children if they are allowed to discover them firsthand, rather than from textbooks. If children are allowed to build relations with things in the early years (up to age 14), their interest will be there to make facts mean something later. 02. Children must also be free to run and play, experiencing the natural world and natural laws (like gravity) physically. 03. They should have intimate knowledge of the properties of mediums such as clay, water, sand, paper, wood, food, metal, leather––from handling them in play and craft-making. 04. The child should be on friendly terms with the wild creatures that enter his yard––birds, animals, insects. Exposure to a multitude of ideas is necessary because we don't know which idea will spark a child and lead to great deeds later. Young Henry Rawlinson's conversation with Sir John Malcolm inspired him later to search for and discover the key to deciphering the cuneiform letters of ancient Persia. We may not all achieve greatness, but who knows how many deeds have gone undone because the person who might have been gifted enough to do them was never exposed to the idea that would have sparked an interest? Education will continue to limit opportunities for human intelligence as long as we view people as an assortment of faculties rather than whole persons to be nurtured and inspired. We should expect more for our children than just the ability to provide themselves with a life of comfort and ease by getting a decent carreer. Life and joy is much more than a steady job and prosperity! Today's psychology views people as states of consciousness--chemical reactions. No wonder people with this view don't feel the importance of ethics or duty! Those belong to the realm of religion, which teaches the Ten Commandments and the Golden Rule, not the realm of people who are no more than 'states of consciousness.' There is no attempt to teach ethics systematically with moral books; instead, the focus is on books that entertain and keep the child's interest (yet so often homeschoolers insist that books that merely hold a child's interest qualify as CM living books. Might Herbartianism be detected in such a perspective??) Duty, compassion for the brotherhood of man, and morals are often given lip service, but no real attempt is made to choose books with that focus. Children should be familiar enough with philosophy to form their own worldview intelligently. How we act is guided by what we believe; for instance, understanding the power of habit underlying Charlotte's philosophy will provide the conviction to train habits that will replace laziness and greed. Therefore, children should think through their belief system and not blindly accept that of their parents, or teachers, or culture. Children should be able to 'rub shoulders' with people of all classes. A child will never benefit from the experience of a skilled sailor or fisherman if he feels himself too superior to talk to them. Young children are interested in garbage collectors, firemen, construction workers. Learning from them will give them firsthand knowledge that they will carry with them all their lives. Children should learn to be competent and confident in public speaking if they are to be adults who will lead, whether in politics, or outreach committees. Such skill is important for everyone and will help anyone to be a better citizen. 06. Children must learn about God and their duty to Him. Religious sentiment doesn't substitute for duty––children must feel that loving and obeying God is a duty, not an option. But duty doesn't replace a living relationship with Him. Herbart, mentioned back in chapter 6, defined man's soul in such a way that it left little of man's personality. Yet Charlotte takes a whole chapter to note the few things that her philosophy has in common with Herbart, who, though he has plenty of shortcomings, she considers admirable because of the forward progress he made in education. Herbart didn't believe in Locke's perception of the mind as various faculties that needed to be developed. Herbart saw man as a whole––one mind, not many parts. The whole person is to be educated, not his separate faculties. Herbart saw the value of dominant ideas to the mind. Nobody can pinpoint where these ideas originate from, but we see their power in the popular opinion of the common man. In fact, once an idea is popularized by the genius who first presents it, the idea takes such root that soon it becomes such a household word that no one remembers where it came from! And another genius may refine the idea in some work of his own. Herbart recognized that children are influenced and educated, not only by teachers and parents, but also by nature, their church, their government, and what Charlotte calls "Zeitgeist." (zeit––time, geist––spirit) Zeitgeist is the flavor of popular opinion; we see it today in the media. All of those influences must be taken into account when considering a curriculum. Herbart valued the family unit as the center of society, the child's primary influence, and where he gets his perception of God: a child will trust God as a loving Father if his earthly father is loving. Herbart recognized that all truth, whether from a Christian genius or a pagan one, is from God, and therefore all good knowledge is divine. Certain facts or fields of study shouldn't be dismissed because the vessel they come in is unholy. Herbart agreed that a parent's role in the raising and education of his children is so great that it isn't overstating to say that the future of a society rests on the parents' success in the upbringing of the children. Herbart saw that education was progressing by scientific discoveries, but that we might never know for sure whether we were correct in our understanding of its workings because we have no way of measuring our progress against our goals. Yet we must have clear and lofty ideals, aim for the sky, but be specific. For instance, we must not make independence the goal for our children because independence might be used for evil as well as good. We need to be more specific. Herbart said we need to make good character our goal, and the academics will take care of itself. Herbart saw that, although man might be spirit and mind, only the brain was a physical thing that could be measured. Charlotte agrees, and brings up the scientific evidence of the brain being affected physically and measurably by new tissue growth when habits are learned. Herbart saw the importance of formative ideas on the brain to inspire, but Charlotte goes one step further and adds habit to ideas, because it is the habits that lay new tracks in the mind inspired by ideas. Yet, for all the good ideas that Herbart had, his philosophy eliminated personality from man. In Charlotte's day, there was much interest in physical fitness and strong bodies capable of heroic deeds. But the motivation to be fit for one's own pleasure in the sport or for love of adventure is self-indulgent. There is nothing wrong with enjoyment, but the motivation should be making our bodies fit for service. We don't belong to ourselves but to God and we must be physically ready when He calls us to any task. Our lives and bodies belonging to God also discourages us from being reckless with our health or committing suicide. This emphasis on being fit for God does not reduce the pleasure of life, because life itself is enhanced with some discipline and fitness. And Charlotte isn't talking about putting the body through hardship; the fitness she has in mind is a reasonable amount of physical exercise, and she recommends types of reading for educators that will be of use in setting a right priority on physical health. Sports can be a way of learning good moral habits––but only if those moral habits are reinforced by making them a regular part of home life as well. Self-restraint keeps a child from overindulging in sweets, amusements or other lazy or greedy excesses. Self-control helps children maintain presence of mind in a crisis and keep their temper in small annoyances. Self-discipline makes children careful, tidy and prompt even when on vacation. If a child has good habits only at school, or in one home but not another, or only when supervised, then the good habits aren't really a part of him, they're just a pretense. Alertness helps children catch every opportunity to do a kindness, carry a burden or open a door for someone. It keeps them on guard so that they don't miss a chance to gain some knowledge. In many cases, it isn't the most talented who succeed, but those who are alert enough to recognize and seize opportunity. Quick perception allows a child to see and remember details of what he sees, hears, feels. Stimulating ideas, such as moral lessons read in a classic book, can inspire a life of upholding noble ideals. Fortitude helps children bear up and endure long inconveniences and discomforts. Service is inspired from knightly examples, as is Courage, which children must understand to mean that the deed takes precedence over the person doing the deed. Prudence keeps children from taking reckless chances. We all know that we live under certain physical laws (gravity makes you fall, germs make you sick, fire burns you) and moral laws. But most fail to recognize that there are intellectual laws, too. We tend to think we're free to form our own opinions and think about what we like. But God is in authority even over our minds. We may think everything is open to question and nothing is absolute, but three things are true: God is, Self is and the world is. Though evolution attempts to deny God, and existentialism attempts to deny the world, and both seek to give Self priority, we are only able to be humble when we accept that God and the world are real. Reason is unlimited. How many times do we sleep on a problem and awaken to find the solution in our minds, as a gift of God rather than our own problem-solving? That kind of intuition isn't credited to our reason. Our reason may cause us to logically justify all kinds of errors––once we make up our minds about a person or idea, our reason tends to 'see' the logic of what we've decided to believe. Feuds and wars are built on faulty reason. Therefore, it is important to be careful of which ideas we let ourselves entertain. Intellect, though we pride ourselves on crediting it to our human condition, is a divine gift, created by God. Knowledge is not the product of genius men, but a gift of God, an inspiration of His Spirit. Great ideas aren't just philosophical meanderings, they result in practical changes of action. Meditation, which is related to reflection, is another great habit. Reflection goes over the past and thoughts we have had; meditation goes beyond that and wanders to all aspects of an idea. Intellectual life needs living ideas to thrive. Predictable stories do not feed a child's mind but only bore the child. The best books, poems and art will stir children. They don't need books specifically written for children; 75 percent of any Best 100 Books lists should be within the grasp of a child of 8 or 9––books such as Rasselas, Eothen, Robinson Crusoe, Faerie Queen give children living ideas to feed on. We can't predict what any specific child will take a fancy to––their minds are theirs, and they have their own favorites. A child brought up on classics may grow into it slowly rather than with a sudden 'literary awakening,' just like children raised in a Christian home may not have a sudden conversion. Give children plenty of excellent examples of nature, life, love, duty heroism, and let them take their pick as to which they take to. Children's minds are independent and will make their own selections from what is offered. As long as it's all good, the child can't make a bad choice. Noble ideas clothed in the best works––this is the kind of material that should make up an educational curriculum. Charlotte suggests that parents might read more about children's tastes in books, how ideas are assimilated, what children tend to grasp from books, and leading ideas in various subjects, with a reminder about the fresco showing ideas being divinely given to men. This fresco, at the Spanish chapel at Santa Maria Novella, Florence can be viewed online. She closes the chapter with a description that Coleridge wrote about Plato's educational aim: "He desired not to assist in storing the passive mind with the various sorts of knowledge most in request, as if the human soul were a mere repository or banqueting room, but to place it in such relations of circumstance as should gradually excite its vegetating and germinating powers to produce new fruits of thought, new conceptions and imaginations and ideas." The mind is not a vessel for stuffing facts, but a living thing that creates from ideas. Charlotte lists three underlying principles of her schools: 1)––Authority as a law is universal 2)––Habit training is a vital part of education 3)––Ideas have power to inspire. Authority is the basis of moral training. God is the supreme authority, and puts some people in authority over others. We owe Him our obedience, and we ought to obey those in authority over us. Even those who don't acknowledge God have a sense of moral authority, a feeling that they must and mustn't do certain things. Those who know God have a more specific idea of what is required and what the penalty is for disobedience. Parents must never forget that their authority is a trust from God and should never be abused. Just like God's authority is made up of principles (spirit of love) rather than legalistic rules, parents should rule by principle rather than arbitrary rules. Yet we must be careful not to do what seems right in our own eyes, because there are moral laws that are universal, although even in Charlotte's day, the trend was for each person to decide right/wrong for himself. Parents must also remember that obedience that is forced by coercion will backfire and turn to rebellion. Although the 'truth is relative' idea is as old as Socrates, Christians know that truth is absolute; it is in God's word and must be heeded. Such truths as mother love, the contentment that comes from having a clear conscience, the law of gravity––these are not relative, but true for everyone. We are all born with a conscience, but until children learn right from wrong, they may have odd ideas of what is good or bad. Our conscience must be educated. Children aren't born with moral understanding (they may feel that a lie is bad even when it protects a life), and must be taught before they can really choose right or wrong. The Ten Commandments, Duty towards God, and Love Thy Neighbor are the foundation of moral education. Poets have written about the joy and glory that comes of following through on a conviction of obeying God even when that is difficult. Giotto's Virtues and Vices fresco in the Arena Chapel in Padua taught illiterate medieval people the moral virtues. But how do we learn them today? Yes, we have Scripture––but do we have a systematic method of passing its moral lessons on to our children? Children are motivated to godliness by example––they want to be like a beloved parent, or trusted family friend, or admired hero. So we present examples of noble character to our children in people: heroes and noble examples in biographies and literature, including the Bible, church art showing Biblical heroes, poems of patriotic heroic deeds, mottos children collect in their own copybooks––these present the ideas that will inspire our children, and these are our morality curriculum. When children understand their duty in choosing which thoughts to dwell on, and develop the habit of keeping only the good thoughts, their moral education is secured. Parents of young children can read their child's face and catch a bad thought in his expression, and are then able to help the child make a detour by thinking of something else. It is helpful to know specifically which virtues we want to encourage in our children, yet we must remember that good behavior is not what saves us. Knowing God is more important than obeying rules and having moral virtues. Charlotte's thoughts on religious training are not meant to be exhaustive. Children need to feel that God is always near and is the supreme Authority; this will inspire a sense of duty and reverence instead of the willfulness and flippancy that is seen in many youths. Higher criticism has cast doubt on the reliability of scripture, and even the existence of God Himself. Charlotte wanted her schools to reassure parents that God and his word could be trusted, and thus their parental authority, given by God, was secure. Another modern trend, questioning all authority and making oneself the highest authority, put parental authority in jeopardy. Yet submitting to proper authority doesn't compromise individuality and shouldn't be seen as a threat to personal development. Religious education has its own habits to be trained. Keeping joyful thoughts of God helps a child feel that he lives in God's presence. Being reverent at mealtime prayers, in church services, and family devotions prevents flippant attitudes about God and is not a burden for children, as they love little ceremonies. Children should do regular devotions, even when their mother can't lead them, and they should pray at night before they're too sleepy. Children should read passages from the Bible rather than isolated scriptures that may be included in devotionals. Yet children should be discouraged from feeling any superior pride of accomplishment from the exercise of reading long scripture texts or saying long prayers. Children should praise and thank God in their devotions and with prayer and songs. They should pay attention during church service. They should spend Sundays reverently as a day of rest and keep the day special. What kinds of vital ideas should be given in religious training? First impressions are important, so young children shouldn't be introduced to God merely as someone who watches them to punish naughtiness. Instead, they should know God as a loving Father, a King to whom they bestow heroic devotion and loyalty, and a Savior. Even young children feel guilt over their sins and can find relief in a Savior. Children should know that the Holy Spirit lives in them and is not just a part of their church life, but is there in all of their life. Church things are no more divine and spirit-filled than secular truth. These are just a few things Charlotte wanted parents to think about in religious education, but she did not intend her chapter to be the final word on the subject. Education is an atmosphere, a discipline, a life. An ambitious motto, but one doesn't reach the stars by aiming low. This motto must be taken as a whole. Education is an atmosphere––if we take just that part and fill a child's environment with art, books, music, then the child becomes lazy and expects to be educated simply by being surrounded with entertainment and with no effort on his part. Education is a life––if a life must be filled with education, then one might wear himself out chasing ideas and busily doing educational activities. Education is a Discipline––if we focus on habit training and curriculum in each subject, we end up with a dry, lifeless system. The use of education as a way to develop the faculties falls into this error. But man is multi-faceted and needs to develop and grow in all aspects simultaneously. These three must work together. Education is truly a life and is for the growth of the whole person. The fresco in the chapel of S. Maria Novella shows divine spirits of secular knowledge descending on earth because all knowledge is of God and is united in its origin. The unity of spiritual and secular makes up life, and we can enjoy both. Science is not to be dismissed as secular, because all true science is divine truth. This unity of all truth originating from God is an old idea. Ancient philosophers sought to find the one element that all matter was comprised of, and even today in 2003, scientists hope to find one element, or truth, from which everything else is made. Truth, even in science, will lead us towards God, so we don't need to be afraid to teach our children about the latest discoveries. As science brings new information, we come closer to understanding, though we will never discover everything, so our understanding will always be incomplete. Education should not only work inward towards unity, but outwards in exploring the world, the past, and the fields of art and music––all of life. If we focus on one subject––technology, for instance––the student becomes unbalanced and narrow-minded. Children should form relationships with many things, many subjects, many fields. The more relations he forms, the more he will experience life. Children need to learn first-hand from the best books, and they should be left to reflect and come to their own conclusions rather than lectured and told what to think about their lessons. Children must be allowed to learn all subjects, not just the ones that will guarantee a lucrative job later, because we don't know what will ignite interest and enhance his life. We as humans tend to need to hear the same thing again and again to wear away our preconceived ideas in the face of tradition. Charlotte tells about part of a book in which two girls who have adopted Greek names after stories they have read, fight bitterly over who was the greater king, Charles II or Peter I. Where did their imaginativeness and passion come from? From their school books! This kind of enthusiasm does not come from dry text books. Left to their own devices, girls may prefer frivolous romance novels, and boys may prefer fast tales of adventure with little substance. We all like light reading and there is a time for it, but that's not what feeds our souls. School texts tend to be so abridged (an attempt to squeeze more information in by removing the frills?) that there's nothing left but dry, dull facts, good for memorizing to pass a test, but hardly the kind of material that stirs the imagination and is retained in the memory. Good teachers know that text books don't have enough 'flesh' to hold interest and teach, so they fill the gap with lectures to 'flesh out' the material. An excellent, inspired teacher who knows and loves the subject will ignite young minds, but if the teacher is merely passing on second-hand research, the students will be just as bored as with a text book. But good teachers are rare, and it should be the teacher's task to discipline and guide rather than be an expert on lots of various subjects for the purpose of lecturing. We want children to be interested in many things. We want their lives to be touched and enriched by the beauty, wonder and thrill of various subjects. "We cannot give the children these interests; we prefer that they should never say they have learned botany or conchology, geology or astronomy. The question is not, how much does the youth know? when he has finished his education, but how much does he care? and about how many orders of things does he care? In fact, how large is the room in which he finds his feet set? and, therefore, how full is the life he has before him? I know you may bring a horse to the water, but you cannot make him drink. What I complain of is that we do not bring our horse to the water. We give him miserable little text-books, mere compendiums of facts, which he is to learn off and say and produce at an examination; or we give him various knowledge in the form of warm diluents, prepared by his teacher with perhaps some grains of living thought to the gallon. And all the time we have books, books teeming with ideas fresh from the minds of thinkers upon every subject to which we can wish to introduce children." Our problem is that we underrate children. We think they can't handle hard books and that they need adults to dumb them down and abridge them. Yet Charlotte tells of William Morris reading Sir Walter Scott as a four-year-old. Macauley, at four, knew the story of Robinson Crusoe. Books in generations past treated children as if they were capable of handling mature moral material and held children responsible for heeding moral knowledge. They didn't think such knowledge was beyond children. And that is true––children are intelligent, observant and have a strong conscience. All they need is knowledge of the world and people, and help in learning to control themselves to attain their potential. We know that habits determine conduct and character. We know that ideas inspire willing changes of habit. Therefore, we present inspiring ideas in many fields and subjects, and train the child to have good habits––God will do the rest. With the presentation of ideas and training of habits in mind, how do we choose books? We demand that each subject have a fruitful idea at its foundation. We teach math, grammar and logic to help discipline the mind for orderly thinking (we value them for the training of good habits, not for their attempt to 'develop faculties,' since the faculties are already there.) We choose history books that get us in touch with real people and places. The Bible is the best book for forming 'moral impressions' and children enjoy its stories. Children can thrill to its tales and be touched by its examples of devotion. They should be left some room to meditate on it alone, since God speaks to us in solitude. Children should dig knowledge from books themselves, rather than have a teacher tell them what to learn from a book. Knowledge that we get ourselves makes the most impression and is remembered. Children should deal with the author (who is really the one teaching them) firsthand. The teacher doesn't need to be a go-between by lecturing and explaining about the book, though the teacher must watch students' reactions and determine whether the books are living or not. Size and length do not determine whether a book has living ideas. Many times living books are written by an author who wrote first hand about a subject he loved, but sometimes someone who loves a subject can collect information second-hand from books and make it more palatable to students. That also qualifies as a living book. A living book is enjoyable for students to read. Its ideas must make a "sudden, delightful impact" on the students' minds, inspiring them. Students must work at getting knowledge from the book by classifying, generalizing, etc. Narration should be required after a single reading. If needed, the reading may be very slow, but may only be done once. Repeating gets children into a lazy habit of listening halfway and not grasping information the first time. Exercises may also be done with school books as variations of narrating and ways of extracting knowledge: "enumerate the statements in a given paragraph or chapter; to analyze a chapter, to divide it into paragraphs under proper headings, to tabulate and classify series; to trace cause to consequence and consequence to cause; to discern character and perceive how character and circumstance interact; to get lessons of life and conduct, or the living knowledge which makes for science." If the teacher isn't lecturing and explaining the textbooks, what job does he do? The teacher looks over the text and decides which exercise will best help students extract knowledge from that book and train mental discipline, and he assigns this to students. Care must be taken so that doing the exercise/narrating doesn't overshadow the main goal of reading the book––which is to be inspired by its vital ideas. Books are living, and too much busy work analyzing them can kill any interest for the student. Charlotte opens this chapter with a quote from Wordsworth's Prelude about how nobody can discern which thought in our mind came from exactly where. Our thoughts, knowledge and ideas are so intertwined that it's impossible to sort out what came from where. Education is an atmosphere (so we make the most of circumstances as opportunities for learning), a discipline (so we train good habits), a life (so we feed the child's mind with ideas). Those three instruments––circumstances, habits, ideas––are the only tools we should use to educate because they are external methods that will enhance any person. Taking advantage of a child's vanity, emotions, or desires to motivate him is tampering with his God-given internal make-up, and we have no right to do that. Children are not like clay in our hands to mold to our will. We must respect the persons God made them. If the external methods are presented, each child will grow in the way God plans. We do a disservice by shielding children too much from temptation and pain, even when presented in fairy tales. We shouldn't go out of our way to expose children to sin and suffering, and they don't need to hear all the graphic details, but we shouldn't hide them from their share of life. They are resilient and can handle the things that their life brings. In fact, those things are educational for them and make more of an impact on the kind of person they become than our educational endeavors. As a child, Wordsworth saw a body recovered from a suicide by drowning, but the warm memories of his other childhood experiences and the beauty of books buffered him and kept that event from imprisoning him in gloom. Education is the science of relations, but not in Herbart's sense of adding to an apperception mass. We all experience life, and our experiences and memories will determine how we relate to our lessons. Knowing this, which lessons and ideas are necessary for us as instructors to present? Babies start making relations early––his mother, family, the dog, people in the street––all become part of his life experience. When left to himself, he explores and reflects and truly learns about what he comes in contact with. By the time he is ready for his "education," he already has lots of these relations. The more varying number of ideas we present, the fuller a life he will have. He needs to learn his duty to be of service, and the joy of effort. He doesn't need lots of busy work and extra activities that only get in the way and hinder him from making relations with inspiring ideas. We don't have the right to limit education to the 3 R's or decide which ideas students may be exposed to as if their life is up to us. Such thinking results in young adults with no real living interests beyond partying on weekends. Our limiting of ideas limits their growth. The more inspiring ideas an individual comes across, the more likely he is to form affinities with some and have interests beyond trivial amusements. Some people have no other highlight in life than weekly poker night, or the latest TV show. A person exposed to many ideas and experiences will have a fuller, richer life with deeper interests regardless of how he earns his paycheck. We owe this kind of a future to our children. Children should have real, living relations with elements such as earth and water. Children learn more when they're left to experience things on their own terms than when we force them––Charlotte gives the example of John Ruskin, whose parents sent him to riding school when he might have learned more, and learned it more enjoyably, by spending a free summer with a pony in the pasture. Children learn more about handling themselves in water from summers spent playing at the pool than from a six-week swimming course. It is mostly suburban parents who try to manufacture learning experiences, because the limitations of that environment don't offer the rich opportunities that are a natural part of country life. Children learn more from keeping up with other children in free play in a natural environment than from formal lessons contrived to learn skating, hockey and tennis. Wordsworth's poems are full of fond memories of romping with peers out in the open, running, playing and experiencing nature. John Ruskin remembered how much he enjoyed building bridges with a set of wooden blocks as a child. Living in the suburbs, he had less opportunity to discover the joy of nature, but he did study flowers from the garden and even pull them apart in his curiosity. He collected their seeds and also collected pebbles and studied minerals in a cave, but had no one to teach him about these things. Later, his discovery of copper pyrites on top of a mountain he climbed reminded him of his love of pebbles as a child and resulted in his book Ethics of the Dust. He read Scott, Homer and Shakespeare but did not find a spark of life in books until discovering Byron as a teen. Somehow, he recognized truth in Don Juan as he never had in the Iliad or any other work. Wordsworth also found truth in books, and power and beauty in the words of poetry. Since we don't know which books will manifest a spark of truth, romance and beauty in a child, we expose children to lots of great books rather than limiting them by restricting their choices. Ruskin's love for history seems to have been sparked by visiting historic places later in his adult life. He had read lots of history as a child, but none of it came to life in his mind's imagination. Wordsworth also failed to be thrilled with history from his books. Neither Ruskin nor Wordsworth were impressed with Euclid. As has been said, we don't know which ideas will inspire a child; not every idea will be delightful to every child, because they bring their own interests and personalities with them, and that may determine which of their lessons will prove to be a source of joy for them. Not only dare we not limit lesson subjects and good books, but we must not deprive a child of any part of life. Ruskin missed out on the joys of comradeship with schoolboy peers and family and servants at home, while Wordsworth had friends and could choose to be with them or alone, and Scott's friendships with Scottish people were the inspiration for his novels. We can't help some things and so we trust God for those things we can't provide; it is possible that Ruskin's lack of friends brought out his gifts and caused him to be the kind of writer he was, but we can't know that and we don't dare deliberately put such limits on a child. The gift of a Turner painting inspired Ruskin to pursue a life of art. He tried his hand at sketching, drew a tree from life until he got it right, and that enhanced his love for viewing nature. Wordsworth grew up in nature and loved it, and that was the inspiration for his life's calling as a poet of nature. Given exposure to lots of ideas and freedom to think and choose, children will make their own relations and select those things that naturally appeal to their make-up. People do not live fulfilled lives on the 3 R's! "Alas, while he was thus permitted to read only for the gratification of his amusement, he foresaw not that he was losing forever the opportunity of acquiring habits of firm and assiduous application, of gaining the art of controlling, directing, and concentrating the powers of his mind for earnest investigation." The habits learned in youth stay with us all our lives. Someone pursuing a beloved hobby may appear to be putting forth no effort, but, to be sure, he is spending a lot of time and work on that hobby. His passion may make the work a joy, but it costs him effort just the same; nothing comes without applying oneself. Even friendships take effort––honesty, overlooking faults, etc., but, "again, labour is swallowed up in delight." Even the best relationship, the one we have with God, is not effortless. We have to take time to nurture it, although, for some, like Brother Lawrence, there is such joy that it may feel effortless and natural. Children have a natural appetite for knowledge in many areas, and their natural appetite is all the motivation they need for lessons. Too much explaining instead of leaving the child alone to reflect. Too many lectures instead of letting the child do the work of extracting knowledge himself. Text books that take living ideas and condense them into dry collections of facts. Using competition and ambition as motives to learn. Children are educated by real things (such as physical exertion from play, craft and building materials, natural objects like rocks and rivers, art, scientific instruments) and from books. Children aged six and up need living books about a wide variety of topics, although they will need their books read to them until age eight. Free use of books replaces mechanical, contrived lessons in reading, spelling, composition, etc. Living books make lessons a delight and stretch children's abilities in an enjoyable way. The use of living books works in all grades. It simplifies, economizes and disciplines any school. Submission to authority is foundational to education even if it is not obvious in school lessons. Respect for the personalities of the students, and masterly inactivity to give children freedom to reflect are necessary. Education does not happen in a vacuum, but takes place in the midst of events in the child's out-of-school life. Education should flow with his regular existence, imparting such necessary-to-life attitudes such as brotherhood of the human race, and including the latest scientific truths. Remember that Education is an atmosphere (so circumstances should be seen as opportunities for learning), a discipline (so parents should train good habits), a life (so parents should introduce a variety of ideas/concepts to children). These three tools may be used, but nothing else––motivating with competition and rewards that play on a child's vanity and emotions is wrong, and to do too much lecturing spoils a child's natural thirst for knowledge. Using those three instruments, the end goal is that "Education is the science of relations." The intertwining of lessons with the child's life experiences will enhance his whole person even into adulthood and increase his chance to live a full life. The child brings his own personality and affinities into the equation, choosing which of the ideas presented he will make his own. Our role is training habits that will enable children to make the most of their lessons, removing obstacles that prevent children from recognizing ideas in their lessons, and providing guidance to children as they discover the world. The more interests a child has, the richer his life will be. If children view knowledge as something only to memorize to pass an exam, then their education has failed them. Knowledge should be 'touched with emotion;' what's important isn't how much a child knows, but how many things he cares about. Children have natural appetites for knowledge. Little boys love adventure and heroic deeds, children love knowing how people live in other parts of the world, how to do things, how to make things. We endeavor to expose students to knowledge in many subjects rather than restricting topics. Children's minds are not less than ours. They can handle knowledge; they don't need to be talked down to. They don't need knowledge diluted or contrived into object lessons to grasp it. Knowledge is different from the dry, dull facts that comprise information. Knowledge is more than that, it is the result of the mind taking in material. A child who extracts knowledge from a book is able to classify, narrate and outline it, but the child who gets dry information can't. He can only mimic the facts. The mind doesn't need any preparation or development to accept ideas any more than the stomach needs exercises to prepare it to digest food, although good habits help children to focus better. Just like children have individual tastes for foods, individual minds crave power, praise, comfort, company, and knowledge to varying degrees. Education, if confused with other natural desires (such as earning the highest marks appeals to the desire to excel), can corrupt the natural desire to know. Knowledge should be its own reward. Children's minds should come into first-hand contact with the best minds of all time––through reading the books they wrote. Teachers are not the holders of all knowledge; they are merely guides. They don't impart all knowledge by lecturing, but they may assist the student in understanding the author. "Thus it becomes a large part of the teacher's work to help children to deal with their books; so that the oral lesson and lecture are but small matters in education, and are used chiefly to summarise or to expand or illustrate." Well-planned lessons and unit studies may interest a child, but the information obtained that way doesn't stick any better than a trivial article from the latest magazine. Children remember better what they extract themselves. No committee of experts can make an adequate booklist for students, because it is the children themselves who know when a book sparks their mind. Experts can distinguish twaddle from simple, and separate the lively from the living, but they can't predict what will attract children. Once a book has been found, the book should do the teaching, not the teacher. He may "put his class in the right attitude towards their book by a word or two of his own interest in the matter contained, of his own delight in the manner of the author." But students should get knowledge from the book themselves. Few teachers are as gifted as the author of a great book, and nothing kills interest in a book faster than a lot of dull lectures about it. Lectures should be used sparingly "to introduce, to illustrate, to amplify, to sum up." Models and visual aids should also be used sparingly. The mind needs language to conceive ideas, and too much visual aid dulls the mind's ability to grasp the concept. Charlotte herself grasped what a torpedo was more clearly from an expert explaining with a few sentences and an eyeglass case, than she did by viewing elaborate models and diagrams, although a teacher sketching a quick diagram to illustrate may be helpful. Contrived unit studies that coordinate subjects are not necessary––students don't need to calculate the number of supplies needed for the Armada as a math lesson in order to grasp the history of the Armada. Our goal in education is to broaden the mind of the student, inspire him to be of service, enrich his whole life with interests. If a youth graduates with no interest in anything but football scores and prejudices, then his education has failed. People are largely considered intelligent or dull depending on how many things they're interested in. Things (nature, building materials, art, etc.) and books are what educate. It isn't enough to take snippets of fact from various books, children need all of a book that transfers living ideas from the author to the child. Through reading they learn to write, and through developing the habit of reading comes readers. In history, literature, art, languages, geography,––children want most to know about people. They form relations with characters they meet in their books. In science, they want to know about things (discoveries) as well as the dramas of the men who made the discoveries. In religion, children make relations with God and the ideas of loyalty, worship and service. So, curriculum can be divided into religion, languages, math, science, art, physical exercise, and crafts. Religion––The Bible is the best curriculum. History––Students should learn English history from one book studied for several years, contemporary French history, and Greek and Roman history, which can be taught using Plutarch's Lives. Languages––Students should know English grammar by age 12 and be able to read and speak some French, a bit of German, and read simple stories in Latin. Math is generally already taught sufficiently in schools. Science––Science is taught with nature study up to age 12. Children should be able to recognize and name plants, rocks, constellations and animals. Observation is sharpened by having students sketch what they see in nature notebooks. Students take a weekly nature walk and the teacher gives very little direction except to answer questions about what the children see. This kind of knowledge is foundational to later science lessons. The goal of nature study is not to acquire facts but to instill familiarity with the environment. Geography, geology, weather, the sun can all be learned casually on these walks. Occasional object lessons on such things as plant hairs or wing diversity may supplement nature study. Books for science should encourage observation and discovery rather than present names of things to memorize––nomenclature is learned by asking the teacher on nature walks. Only those children who are curious should view findings under a microscope. Drawing––Children should use charcoal or brushes, which encourage free rendering and shading, rather than pencil. They may enjoy illustrating stories or poems, although that is more creative than educational. Picture Talks––Children view and handle reproductions of art. Younger children (ages 6-9) narrate details, loosely sketch some main lines and shapes from the painting, guess time of day and tell the story that the painting shows. Older children can also learn about composition, lighting and style. The goal is appreciation rather than creating. Using real books instead of assigning busy work and book reports makes for shorter lessons. Charlotte's students did their lessons for 2 1/2 - 4 hours in the morning with a half hour break in the middle for drill (exercise). An hour or two in the afternoon was spent on handicrafts and nature study. With shorter lessons, more subjects could be included and, with greater focus, students absorbed more from those lessons. What about utilitarian education, training a student for a specific vocation as his education, while leaving out irrelevant studies? Charlotte says this is immoral, and that a well-educated, broad-minded person who has been trained in good habits will be a better worker no matter what his profession. Such a person will have relations (as opposed to fleeting, idle curiosity) about many things. And, although current emphasis is on 'teaching kids to think,' a child can't think with an empty mind; he needs inspiring ideas to think about. We experience this when we read something that makes us ponder and ask questions––the idea put into our mind has made us think. But the more education uses contrived means to mold minds and develop the faculties that 'teach thinking processes,' the more real knowledge and inspiring ideas are squeezed out. All that is needed to teach thinking is abundant knowledge. Education fails for six reasons. Oral lessons from mediocre teachers replace high quality books. Carefully contrived lectures replace original thoughts of brilliant authors. Dry, dull textbooks are used. Natural curiosity is replaced with grades and prizes. Graphic models and presentations that don't require any effort from the mind are used. Graded readers with controlled vocabulary are used instead of well-written books. Most children have a natural curiosity and only need good books to learn about a variety of things. As a Chinese artist may disconnect his mind to create a totally new image that may not relate to anything, our education based on untried theories contrived in the minds of philosophers may yield something irrelevant. Instead, we should envision our desired goal and use tested methods to get there. Children are too valuable to be used as guinea pigs of educational fads. A truly educated person has real interest in lots of things. While children may enjoy the diversion of schooltime, do they truly love knowledge about lots of things? Only love for knowledge and the exercise of extracting that knowledge oneself from books brings lasting satisfaction and makes a person truly educated. If public schools have any success, it is only the result of the bit of real books they still use that creates intelligent readers. If a student graduates without becoming a diligent reader, he is not likely to become one later. 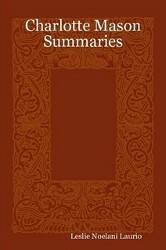 Appendices at the end of this volume sample Charlotte's curriculum, lessons, books, and tests. Comparing them with public schools will show that schools need revolution, not reform.